Although Bifrenaria orchids are relatively unknown in cultivation, they may be a very good choice for orchid growing even for beginners. The first thing to know about Bifrenaria orchids is that they are exceptionally beautiful – large species have big, 3-4 inch wide showy and often fragrant flowers, miniature species have very beautiful flowers as well. The second thing is that, despite the fact that there are only 23 species in this genus, there are numerous cultivars and morphological forms, you can collect cultivars of single species, so Bifrenaria orchids are really good collector items. And the third thing – they are relatively easy orchids to grow – so it is a real mystery, why they are not so well known and not so popular in cultivation as many other orchids. Bifrenaria orchids are sympodial plants of tribe Maxillarieae, so they are related to Maxillaria, Zygopetalum, Lycasta, Stanhopea. They are mostly lithophytes, epiphytes, and terrestrials from Southern America. They can be divided into two morphologically separate groups. The first group contains medium to large species such as well known B. harrisoniae, type species B. atropurpurea, B. inodora, B. tyrianthina, but there are also epiphytes such as B. calcarata, B. mellicolor, B. tetragona and B. wittigii. They have large, profound pseudobulbs which are tetrahedral in section and somewhat resemble banana for their profound ribs and yellowish color (which is not sign of disease or rotting nut perfectly normal pseudobulb coloration for some species), leaves are large and ovoid on an apex of pseudobulb, and there is one leaf per pseudobulb. Flowers are large, waxy and fleshy. The second group contains smaller species with more little flowers, they do not have so large and visible pseudobulbs and could be mistaken for Maxillaria (and these smaller species once were identified as Maxillarias by botanists). They are epiphytes and they are smaller, their inflorescences bear more flowers (which are smaller) and longer, flowers are not fragrant. The smaller Bifrenarias are B. venezuelana, B. longicornis, B. aureofulva, B. charlesworthii, B. racemosa, B. clavigera, B. sylvan, B. leucorhoda, B. stefanae, B. saxicola, and B. vitellina. The most widely known Bifrenaria is Bifrenaria harrisoniae. It has large, 3 inch wide flowers with purple, hairy lips and creamy sepals and petals, flowers are extremely lovely fragrant. And there are numerous varieties of Bifrenaria harrisoniae: some genera are not so polymorphic as this species is. B. harrisoniae var. alba has white flowers, B. harrisoniae var. alba-plena, B. harrisoniae var. angustior, B. harrisoniae var. buchananiana, B. harrisoniae var. citrine and B. harrisoniae var. vitellina have yellow sepals and petals, B. harrisoniae var. eburnean has ivory sepals and petals, B. harrisoniae var. flavopurpurea flowers is yellow-purple, B. harrisoniae var. glabra has more glabrous lips, B. harrisoniae var. grandiflora has bigger flowers, B. harrisoniae var. insularis, B. harrisoniae var. minor is smaller, B. harrisoniae var. pubigera, B. harrisoniae var. purpurascens flowers are purple, B. harrisoniae var. typica, there are nearly numerous cultivars of this amazing, extremely variable species. Despite its name, flowers of B. inodora are not odorless, instead they are ones of the most fragrant of all orchids, its flowers are 3-inch wide yellowish-purple. B.atropurpurea has beautiful 3 inch wide dark purple fragrant flowers. B. tyrianthina’s flowers are also variable – they are 4 inches wide and could be either snow white with purple lips or could be yellow with purple burnings with deep purple lips. B. aureo-fulva is quite differing from these species – it is smaller, its inflorescences are longer, it bears more bright-yellow 1 inch wide lovely flowers. Bifrenaria orchids cultivation is a quite simple. They are mostly sun-loving – so they need the same light levels as for Cattleyas, so give them bright light with some direct sun. Temperatures are warm to hot – so they are extremely good with standard indoor temperatures and do not need lower temperatures or special temperature regimen. Many species have dormancy in winter when they do not need any care at all – this is simple dry dormancy, you simply don’t water them, they do not need lower temperatures, and only in spring when new growth starts you should resume watering. Watering should be ample when the orchid is actively growing, besides watering you should use balanced formulations of fertilizers. As pseudobulb matures reduce watering. The potting mixtures should be well aerated and well drained because of the risk of rotting, epiphytically species grow best in the pure medium bark with some tree fern, cocoa fibers and so on, lithophytes grow best in lava rocks – they are good in mimicking their nature habitats. Smaller species are more delicate – they require high air humidity with strong air movement and they grow best when temperatures are warm to hot. 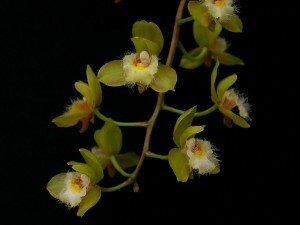 Given the fact that Bifrenaria orchids care is relatively simple, these wonderful, easy in cultivation is a good choice for orchid growers and it is the wrong situation that these nice orchids are insufficiently known in cultivation, notwithstanding their beauty, polymorphism, and easiness in cultivation.